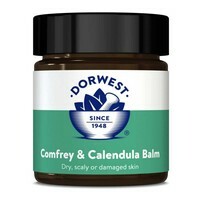 Dorwest Comfrey and Calendula Balm is for use on dry, scaly or damaged skin. This soothing balm contains ingredients that are organically produced and traditionally used for their effective soothing and comforting properties. Perfect as part of any pet owner’s pet care kit, Dorwest Comfrey and Calendula is ideal for use on skin folds, pressure calluses, to protect sore pads, and on areas of roughened but unbroken skin. My 12 year old collie cross has had dry scaly skin on his "elbows" for over a year. The vet said that as it wasn't cracked not to bother - it was his age. It obviously irritated him as he was constantly scratching. I rubbed this on twice a day and the improvement was almost instant. Within 3-4 days he had stopped scratching. His "elbows" are no longer dry and scaly and the fur has grown back. Brilliant product!